Dædalus Conservation has been featured in a BBC Two programme, Britain's Tudor Treasure: A Night at Hampton Court. 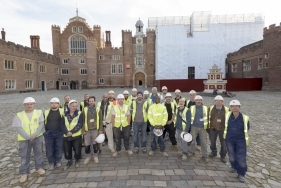 As part of the 500th anniversary celebrations of the historic royal palace, camera crews paid a visit to our craftsmen and women on site, to catch them working with traditional techniques and materials that would have been used in the period of King Henry VIII's reign. The team is currently carrying out repairs to the external facade, as well vital repairs to the roof. You can watch it on the BBC iPlayer for the next 30 days.